One of the less-written about underground industries in higher-end audio are speakers you build yourself. They used to be more obviously popular than they are now: KEF, for example, regularly sold its speakers in kit as well as finished form, but even a cursory glance around the web reveals a thriving little industry of designs, blueprints, drivers, cabinets, and crossovers available in various stages of completion. Even less acknowledged are those private speaker makers who have quietly, often over many years, created one-off speakers for individual clients, and who have been able to tailor speakers to a client’s requirements. Indeed, I still have (and use) such a set, of KEF B109s in huge cabinets, and Radford mids and tweeters in separate cabinets, built many years ago for a British captain of industry. One of those specialist makers is Albertan Terry Flood, who has been building one-off speakers since he was 15. In the 1990s, he was the Canadian distributor for a range of speaker drivers, including Focal. 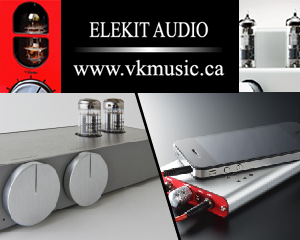 He then decided to concentrate on building speakers himself, in all price ranges, to order for clients in the Edmonton area. He has gathered quite a reputation in the process (a beautiful example can be seen on this Facebook link). With the opening of the audio-shop 3db Sound in Edmonton, Terry has now – while still taking personal orders – expanded to provide a range of Tflo speakers sold exclusively at 3db Sound: the smallest two-ways (Model 283, $C1,800), the speakers that are the subject of this review (Model 302, $C2,200), a front-ported two-way with an 8-inch woofer (Model 327, $2,995), and a rear-ported three-way stand-mounted (Model 340, $C3,995). Terry is also planning to introduce a centre speaker. All the speakers are named after the engine displacements of classic American muscle cars, another of Terry’s passions. 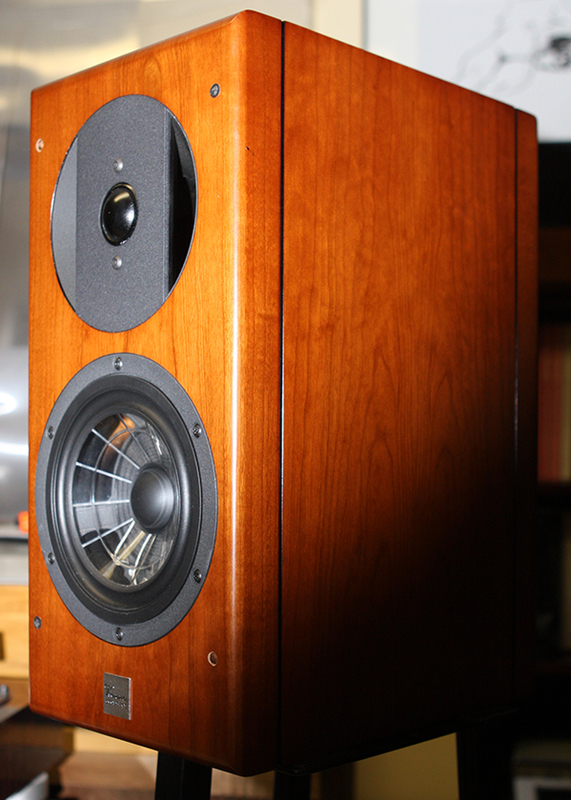 The advantages of buying speakers of a one-person manufacturer are, of course, first the cost. The middlemen are cut out, and there are not the kind of overheads associated with a factory operation. Second – and not to be sneezed at – a one-person maker can lavish personal (or should I say one-person) attention to making each speaker. The disadvantage is that one-person builders will not have the access to the kind of R&D available to company designers, though that is partly offset being able to choose components from major manufacturers that have already been developed and tested. In addition, as Terry pointed out to me, test equipment and software has become much cheaper, putting it in the range of private speaker builders. Terry’s Model 302 speakers are mid-sized two-way, rear-ported, stand mounted speakers housed in the now-fashionable boat-shaped cabinets, with an interior volume of ½ cubic foot (14 ltrs). The tweeters (offset – and the speakers come in matched pairs) are from the Satori range (SB Acoustics), as are the 6½ inch woofers, coned rather exotically in Egyptian Papyrus. The crossovers Terry designs and makes himself, and these speakers present an easy load, nominally 8Ω, and dipping down to just under 7. The sensitivity is 87db, and in practice these speakers should be able to be driven with a wide range of amplifiers. First impressions are visually excellent. I am personally not a fan of high-gloss piano finish – it shows every fingermark, as these did, and since the base of the cabinets are also similarly finished and very slippery, Blu-Tac (Fun Tak) is necessary to secure them to the stands. However, the speakers are also available in cherry and maple, and if Terry’s cabinet standards are anything to go by, those will be equally well made. For the black finish was excellent, and with the black grills in place the Model 302 looks expensive and attractive, one of the criteria for two-way stand-mounted speakers (I wasn’t so convinced, though, by the visual look with the grills off: it’s unfortunate that the surrounds of the mid-range/tweeter are silver, and the bass driver black). The high quality of the large single pair of banana/binding posts was similarly reassuring. I was slightly disconcerted by the noticeable (and irregular) dimple in the centre domes of the tweeters – had they got pushed in in transit? – but Terry reassured me that this is a design feature is entirely intentional: the cone is glued to a little centre post to prevent out-of-phase effects. Overall, these speakers are beautifully put together. One of the reasons I wanted to listen to this two-way speaker was the general question of two-way speakers themselves. Good ones are not cheap, and you have to add in the cost of good stands ($300 to $600). For the same price you can buy an excellent pair of floor standing speakers, with the extra bass extension. One of the objections to floor-standers – their bulk in a room – has been partly overcome by the advances over the last decade or so in the sound quality of smaller floor-standing speakers. So size is no longer so massively in favour of the stand mounted two-ways. It is, though, a popular segment, and after many discussions, I have come to the conclusion that their main attraction is still visual. Two-ways on stands may take up the same volume of physical space, but they look less bulky in a room (something my other half would heartily agree with, though she’s not going to persuade me to change from floor-standers!). They also have some acoustical benefits (hence the expensive recording studio two-way monitors), most notably less complex cross-overs, and a more contained sound-source. I made the mistake, though, of first listening to the 302s in my main system in my living-room, replacing my big KEF 107s. In that room, my ears are too attuned to the KEFs prodigious dynamic range and marvellous sound stage for any two-way speaker to really satisfy me. Hastily, I moved the Tflos and my API spiked stands down to my basement listening room, where I regularly listen to a variety of speakers, and happily the experience was completely different. 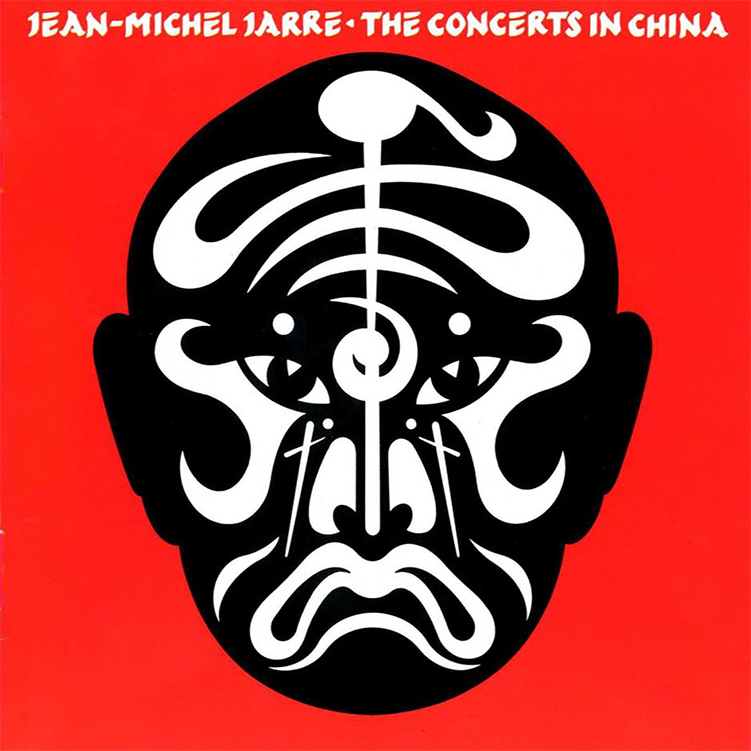 I pulled out some of my favourite test LPs and CDs, from opera (Solti’s Wagner Rheingold, on both London LPs and CDs) through Joni Mitchell (Don Juan’s Reckless Daughter, on CD), to Jean-Michel Jarre’s sonically amazing The Concerts in China double LP. After a little experimenting to find the most suitable positioning and toe-in for the room, the immediate impression was of a bass of quality and surprising depth, given the cabinet size, creating a secure foundation for the upper frequencies. 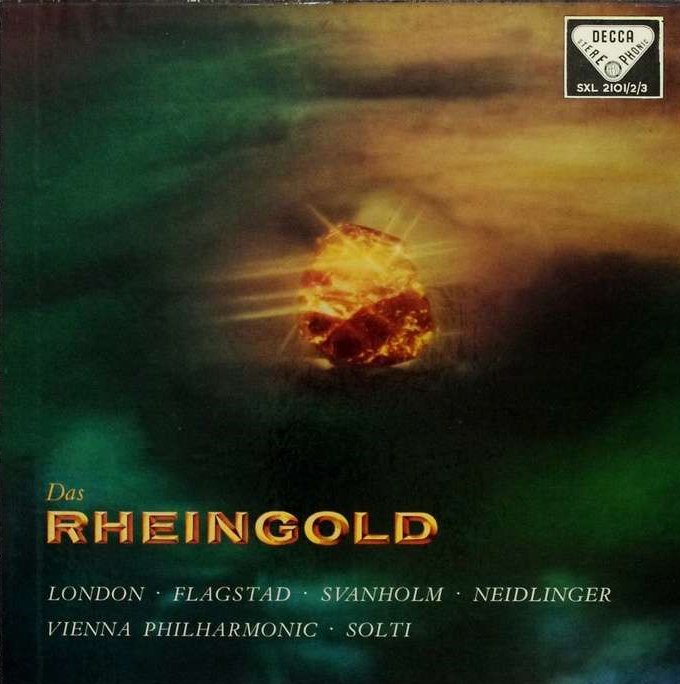 That wonderful orchestral opening of Rheingold, which starts in the basses, and gradually builds up by adding the other strings, was seamlessly presented right though the range. The deep bass note at the start of Don Juan’s Reckless Daughter was very clean and satisfying, if not quite as deep as on a full-range speaker (as is to be expected), and if not quite with the sharpness of attack I have heard on more expensive systems. Equally noticeable was the very big side-to-side soundstage (something that is particularly important to me). Subsequent listening confirmed this, with very accurate placing of instruments, and clear aural space between them. One of the simple tests for me is to listen to my local CBC coming from Edmonton’s studios. I have been in those studios many times, the acoustic is etched into my aural senses, and the Tflios got it just right, with a real sense of the dead acoustic of the studio, and the placement of the voice. As I listened over an extended period, to a wide range of material, I came to like the speakers more and more. They do most things very well, particularly their clarity, the integration between the two drivers, their lack of ‘fatigue’, and that accurate and surprisingly deep bass. Their ‘attack’ is pretty swift, though not the fastest I have heard, and unlike some speakers, I found myself happily listening to all types of material on them, from classical to jazz to rock – in other words, a good all rounder. They are not perfect, though (and what speaker is?). There is a little harshness at the top, and the mid-range frequency range of the voice seemed a little subdued. The combination of the two gives a little edge to the sound. It was not enough to make me dislike them, but I tried a very wide range of recordings I know very well to make sure it was the speakers and not the recordings (and tried a couple of other amps), and that slight imbalance was always there. Some, of course, may prefer that edge, but I did wonder whether Terry might be able to tweak the speakers a little to rectify it. While that side-to-side sound stage was really excellent, the front-to-back was acceptable, but not as effective. That was easily overcome by switching on a pair of Velodyne subwoofers, and adjusting them to match. I use a pair not so much for the bass extension but for the increase in sound stage that a pair of subwoofers can bring, and so it was here – the back section of my basement room became the concert hall, and the 302’s clarity made the most of it. But then, of course, that adds considerable cost (and space), and full-range floor-standers can do the same thing – so I am back to that floor-standing quandary. To get some kind of comparison to a manufacturer-built two-way in a similar price range, Edmonton’s Audio Ark kindly lent me a pair of Vienna Acoustics Haydns, a slightly smaller two-way that has received some positive reviews, but which I had not heard before ($2650 a pair, dedicated stands around $600). They are 4Ω speakers, but fortunately I have a second Sonic Frontiers Power 1 wired for 4Ω, so I could make a direct comparison. A fascinating comparison it was, too, because if Terry’s 302s are primarily aimed at music lovers – albeit with the kind of finish and looks that will suit domestic living room surroundings – the Haydns struck me as boutique speakers. The Haydn’s are gorgeously finished in dark cherry, and look fabulous just sitting there. Their sound is very smooth and warm, quite laid back, but with considerable detail, and lovely in the upper mid-range (acoustic guitar, bells). 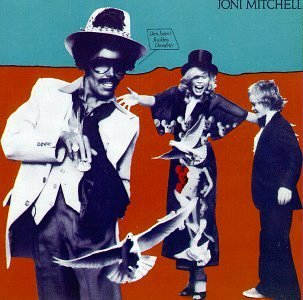 But the bass really doesn’t go very low (that deep Joni Mitchell bass was not very effective), and the imaging – if accurate side-to-side – was very flat. My overall impression was that these speakers would be ideal for many, especially those living in condos – a smooth sound that could happily burble away in the background, not much bass to disturb the neighbours, good clarity for the occasional serious listening, and, with their beautiful finish, almost a decor talking-point without taking up too much space. In other words, rather fulfilling my suspicions about the purpose of stand-mounted two-ways. 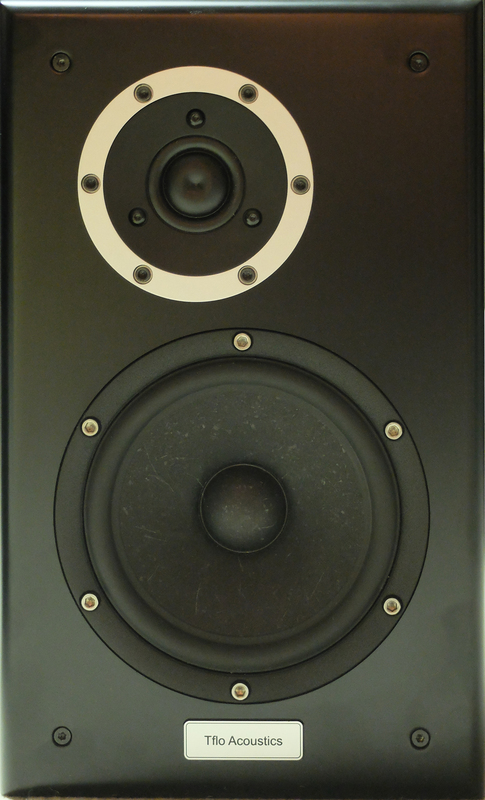 But for speakers for dedicated listening to music, the 302s won this comparison. I did one further comparison which any WallofSound readers on a tight budget will understand – the used speaker comparison. I moved my Celestion SL6s (around $300 to $600 used) out of my study and down into the basement system. These speakers redefined two-ways in their day, though they are definitely more for classical music lovers than heavy metal aficionados, and I was curious to see how they would compare. The bass was boxy in comparison to the Tflo 302s (something that was corrected in the honey-comb bracing of the next generation Celestion SL600), but much more satisfying than the Haydns. The mid-range, though, and especially voices, had that kind of satisfaction good British speakers are known for. But where the Celestions really shone was in that front-to-back soundstage. On one of the tracks on Jarre’s The Concerts in China there is an extraordinary effect where some of the lower electronic sounds are behind the speaker plane, while some of the higher frequency sounds seem to dart out of the front of the speaker and bounce around almost at one’s nose. It’s an effect I have heard on all my larger speakers, the KEFs, Magnaplanars, and Apogees. On the Haydns, they remained solidly between the speakers; on the 302s, they were a little in front; but on the Celestions, there was indeed that projection, front and rear. The answer, in the case of Terry Flood’s Tflo 302s is definitely ‘yes’ – if I were in the Edmonton area I would put them on my audition list, for their overall sound qualities and their satisfying build. And I would also know that I could expect good aftersales from their maker, for, as Terry pointed out to me, “I can’t afford to have an unhappy customer”, and replacement drivers, if ever needed, are easily available. I can think of plenty of friends, though, who would be more than happy to have those Hadyns in their living-room, for slightly different priorities than those of the audiophile. As for the Celestions? Well, I am hanging on to them as my study two-way speakers, but I have to admit it has already occurred to me that, when I want a new pair of full-range speakers, I might well make a trip down to Terry Flood and see if he can build me a pair that would exactly suit my tastes, and the acoustics of my living-room. That can only be done by a practitioner of that esoteric trade, the one-person speaker builder.